Depending on the kind of person you are the a "winner take all" series finale is either the most exciting game or your worst nightmare. Steven Fogarty (NYR 2011 3rd) of Notre Dame has been in this position before as playing for the Penticton Vees of the BCHL 3 years ago, Fogarty and friends had to play 3 straight sudden death games in order to win the Canadian Junior A championship. 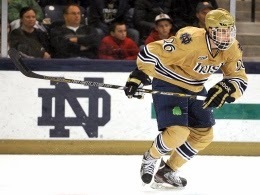 The sophomore forward for Notre Dame and his teammates were facing the number 2 team in the NCAAs and on their home ice no less in a deciding game 3 of their Hockey East series. Well guess St. Patrick's Day came a day early for the Fighting Irish as Notre Dame upsets Boston College 4-2 to advance to the Hockey East semifinals next Friday night in Boston. It is the first time since 2004 that Boston College will not be playing in the Hockey East semifinals. Notre Dame actually trailed in this game 1-0 before tying it up midway in the first period. Notre Dame would grab a 2-1 lead early in the 2nd but Boston College would comeback to tie the game at 2-2. Notre Dame would take the lead for good on a goal with just 4 seconds remaining in the 2nd period. In the 3rd, Boston College through everything they could at Notre Dame but the defense held on until Fogarty would set up Jeff Costello for a goal at 18:08 of the 3rd which gave Notre Dame a 2 goal lead at 4-2. It was Fogarty's 8th assist of the season giving him 11 points on the season. Notre Dame will be taking on UMass-Lowell next Friday starting at 5PM EDT in the first Hockey East Semifinal. The game will be televised nationally on the NBC Sports Network. Ironically UMass-Lowell is 7th in the current Pairwise rankings while Notre Dame is 8th. Griffin Reinhart (NYI 2012 1st) as expected got the day off in his Edmonton Oil Kings final game of the regular season. With nothing on the line, Edmonton sat Reinhart and a few others as they prepare for the start of the WHL playoffs next week. There remains just 1 game left in the CHL regular season and it will be Monday as Jesse Graham's Saginaw Spirit take on the Sault Ste. Marie Greyhounds in a make up game after this game was originally postponed due to the death of Terry Trafford. The Spirit are in an interesting situation here as for starters the services for Terry Trafford will be on Tuesday so that will be an emotional factor. The other thing of interest is that Saginaw might be in better shape for the playoffs by losing on Monday. If they lose then they will face these same Greyhounds in the first round. But should they win then they move up to 6th in the standings and that would mean playing the Erie Otters who have the 2nd best record in the OHL. The Spirit might be better off facing the 4th best team than the 2nd best.